By simply adding a decorative fencing custom design to your property you will be able to give designated area's the privacy to enjoy and plan your outdoor area's. A fencing custom design using standard off the shelf materials you can create a very competitive budget for your fence. Fencing gives your property security and privacy and should compliment the surrounding features that's why timber is still so popular. Give your property boundary a complimentary look and feel with a high grade timber fencing custom design giving you complete privacy and security for your property needs. 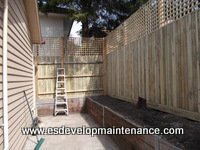 Timber fencing custom design with some simple changes create a stunning effect that you and your neighbours will enjoy for a long time and compliment an existing area. 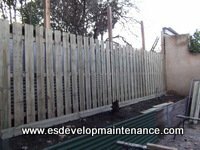 By adding a fencing custom design you are creating pleasant private area's to put in a shed or play area for the kids maybe even a vegi garden there are a variety of fences available to suit your needs and desire timber is still one of the most cost effective and common designs used in fencing. This photo is a simple 2.5meter back lane paling fence with 110mm x 110mm x 2.5m tall cypress pine posts and entry gate these simple fences add more privacy to your existing rear fence line. Creating a new fence line or replacing an old worn out fence first will give you more choice on your other projects that you intent to do in that area as you can then build and construct right up to the fence line and not have to worry about how to get to that part of the fence for a long time. Some materials require more maintenance than others but with careful selection this maintenance can be limited or completely eliminated depending on the surrounding structural requirements required. 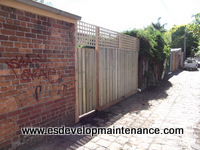 Most councils have fencing requirements and standards so it's always a good idea to check with your local council as to what they except and deem as standard fencing. By keeping your fence line well maintained and in good condition you can keep your property secure and safe as this will stop entry by animals and unwanted persons by installing some gates and locks you can create a simple entry to your property and your visitors. Fence lines are often effected by shifting soil large trees and other structural movement and moisture so different area's sometimes require different types of fencing materials to be used often the soil type needs to be taken into account as well as any excessive moisture that may need to be piped away from the existing fence line. For quality timber fencing and hardware supplies in the Melbourne metro area this family company has been operating for over 50 years please click on the link below.